On Sunday 5 February, 17 students competed for the opportunity to become soloists for the Chetham’s Senior Ensembles concerts throughout the 2017/18 school year. 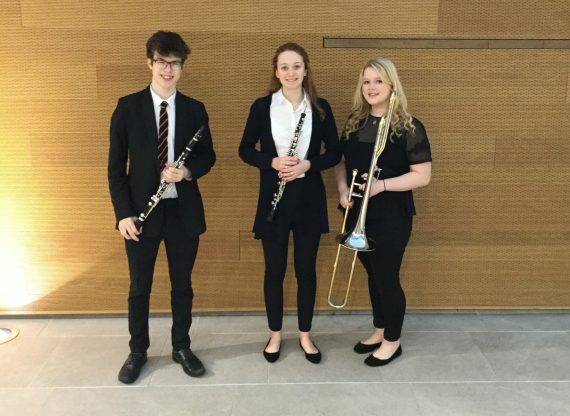 After an exhilarating seven hours of performances, we are delighted to congratulate the three overall winners – Jade Hughes (oboe), Oliver Burrow (clarinet) and Isobel Daws (trombone). In addition, it was announced that external engagements will be sought for Hannah Godfrey-Clarke (double bass), Solomon-Miles Donnelly (piano), Shannon Harper (trumpet) and Harry Toulson (saxophone). Finally, we must congratulate Rose McLachlan (piano) who was highly commended. The judging panel, which featured Chetham’s Director of Music, Stephen Threlfall, Lyn Fletcher (Leader, Hallé), Professor Linda Merrick (Principal of Royal Northern College of Music), Rhys Owens (Principal Trumpet, Royal Liverpool Philharmonic) and Aaron Shorr (Head of Keyboard, Royal Conservatoire of Scotland), were all in agreement that the standard of music throughout the day was of exceptionally high standard. Stephen told us, “After a simply outstanding day in which no fewer than 17 concertos were performed, the Panel had the unenviable task of choosing students to be given the opportunity to perform with Chetham’s Ensembles. Unusually, all three of the recipients were ‘blowers’ on clarinet, oboe and trombone. “I was particularly pleased by the number of people who came and spent time with us (many of them for the complete whole day from 11am until 6pm), listening to and thereby supporting our performers. The Concerto Finals are a very special day for Chetham’s and I am grateful to the Panel for their time, dedication to the task and their concentration. Congratulations to all involved. We look forward to seeing Jade, Oliver and Isobel wowing audiences next October, February and July in venues including The Bridgewater Hall and our very own Stoller Hall!